With permission to use this personal sermon, I’ve changed names to protect privacy. Except for Juanita and Mark, I didn’t know any of those gathered for the celebration (not always the easiest thing for this introvert!). We met Mark’s grandparents and chatted with then over dinner. Boy were they proud of their grandson that day! Eventually Mark wanted us to meet his mother. She was in the living groom, seated in the middle of the sofa. I don’t remember who or how many people were around her. All I remember is that she looked serene or even regal as she sat there. AND she wasn’t interested in meeting me. Maybe Juanita , but certainly not me! This was my first encounter with Mary. Why? Why would the mother of someone who’d become a friend have such a negative reaction to me? Well, we need to back up a bit. Juanita and I were board members at the local nonprofit where Mark worked. That’s how we knew him. Mark had also been talking to me about matters of faith. He told me once that as a child he’d felt the Call to become a priest. But as a young man, he instead spent some time in a futile effort to prove to himself that God does not exist. Why? Why would someone who felt that Call to ministry turn his back, or at least attempt to turn his back, on God? The answer to this question is, also ironically enough, the answer to the question as to why Mark’s mother rejected me at our first meeting. You see, the church had hurt Mark deeply. Just as the church, through the years, even centuries, has hurt countless people deeply. How? By rejecting him because he is gay. By telling him and others that they are condemned solely because of who they are. Tragically, many Christian churches continue to do this. Mary knew of this rejection. She also knew that I was a pastor. Thus, I posed danger to her son. I represented those who could reject him…those who could harm him. This by the way is something I’ve experienced with others as well. I remember being a new neighbor at a neighborhood gathering. I was introduced to other neighbors as, “This is Nancy, she’s a pastor, but she’s nice.” There’s a lot of history in that “but.” As pastor, I represent what, for some, has been a place of deep hurt and rejection. Mary had no desire that day to know me. “So we do not lose heart. Even though our outer nature is wasting away, our inner nature is being renewed day by day.” (2 Cor. 4:16). Here the apostle Paul is writing about the resiliency of what is within…not because of, or through, our own efforts but through the love of God. It is a beautiful and comforting idea. But sometimes that inner nature is undergoing a battle that cannot be seen from the outside. We see that this week in the tragic suicides that are in the news. Sometimes, what is within and given to us by God is distorted and destroyed by others. If you hear the words that condemn you in the name of God, words like, “God hates f—,” then it becomes difficult to hear anything else. Mary, as the loving and caring mother that she was, feared for her son. She feared his responding to God’s call on his life, not because she feared God, but because she feared people who claimed to speak for God. Eventually though, she began coming to Our Redeemer. She was very helpful when we were trying to get a Spanish language worship service going. We used to have lunch after the service. She would tell stories. She would tease. She would laugh. I loved her sense of humor and her laugh. When she contemplated joining Our Redeemer, she shared her concerns with me. Would the Lutheran Church truly be a place that would love and care for her son? Would he be hurt? Rejected? We talked about these things. She decided to join, just in time to vote! So, she was one of the members who voted that day in August a few years ago to make us a Reconciling in Christ congregation. This in Lutheran speak means that we are fully and explicitly welcoming and affirming to our LGBTQ sisters and brothers. The vote was nearly unanimous. A little over a week ago, Mary departed this world. She had been hospitalized for 14 days. I am so thankful that I was able to see her the day before she left us. “For this slight momentary affliction is preparing us for an eternal weight of glory beyond all measure, because we look not at what can be seen but a what cannot be seen; for what can be seen is temporary, but what cannot be seen is eternal. These earthly tents that we have, our bodies, don’t last forever. They fail us. We fail them. We get frustrated with them. We sometimes abuse them. Some of these earthly tents last longer than others. Sometimes we wonder about life. About why some people leave us so early. And why some don’t. The one thing that we can all know is that we too will depart this world. The death of a loved one is always painful. And death is also a reminder that each day we have is a gift. Living each day as that gift means living with the hope that is within us. Living each day as that gift means living in such a way that we are fierce protectors of those we love. Mary taught this by the way she lived with love for all her sons. For this I am thankful. I am also hopeful, because living as fierce protectors of those we love is our Call from Jesus. May we respond to that Call from Jesus to love and protect our neighbor as fiercely. I confess that I struggle reading this prayer from Jesus. Whenever I read it, it seems as if the words go in circle after circle. After about the third circle my mind is dizzy and I’m ready to jump off. Maybe this is why I don’t seem to have preached on this text. But this week, finally, I understood something. This something is connected to the text (and thus message) for the past two Sundays. Which, duh, of course it is…it is all the same discourse. Except that today, Jesus is no longer instructing his disciples, he is instead praying for them. Two weeks ago (Discarded Vines? A sermon on John 15:1-8), we contemplated the vine and the branches. We were reminded that no matter how things may look, we have Jesus. While the vine is pruned, and in a church (or anywhere) this is a might painful process, we have the assurance that we are not pruned away. We have that promise that Jesus abides in us. We are then invited to abide in him. The good news was that his abiding or living in us is not conditional. It just is! Then in last week’s text (The Greatest Fruit – John 15:9-17), Jesus took us a bit deeper. We were reminded that the fruit of the vine metaphor is love. I shared some delicious fruit with everyone and we talked about those things that distract us the way the abundance of sugar masks the natural sweetness of fresh fruit. The good news, again, is that Jesus loves each of us and he loves us collectively, as a church. His commandment is that we love one another…in the same way. About truth and unity and a plea that the disciples are protected. About his joy being made complete…as in love being present. But the world will hate them. Why? If what they are about is love…love of God and loving one another, why would the world hate them? Here’s what I think. The world, as it is referred to here, doesn’t much like love. In the world, it is far better that people are divided and distracted. In the world, there is always a winner and a loser. In the world, there is the in group and the out group. In the world, things like racism, sexism, nationalism and other ismsare the currency of the day. Thatwe love beyond the label, whatever it may be. Thatwe see our neighbor, not as an opponent but as a precious child of God. Thatwe leave our own comfort zones so that we can learn about and build community with our neighbor. None of this should be controversial. But it is. And so, we might stay silent and inactive because we don’t want to be on the receiving end of criticism… of hate. But Jesus is praying for us for expressly this reason. We put a sign in front of our church offering a “Blessed Ramadan” for our Muslim neighbors. We were surprised at the negative response. I once join with other kids in school and became a bully…attacking a fellow student who was Jewish. “Afterwards I felt really bad and went over to his house to tell him I was sorry.” Our relationship was never the same, but we are, thankfully, friends on Facebook today. We all have the opportunity before us to love or reject our neighbor. How will we respond? Sometimes it’s hard to know…unless we’ve thought about, and even prayed about it in advance. And that takes us back to today’s gospel, and to prayer. Jesus prayed for his disciples and today that includes us. It is prayer that helps us to see our neighbor. It is prayer that gives us strength in the face of opposition. It is a prayer that gives us hope in the midst of turmoil. It is prayer that gives us the power to love. Let’s follow Jesus’ example and pray for one another…and then let’s harness the power of prayer so that we can better love God, one another, and our neighbor. On Thursday of Holy Week members of my congregation shared a meal together. It wasn’t an ordinary meal, but rather a worship service with a meal. Something I would like to do again, and like to call, dinner church. This night (Maundy Thursday), we re-heard the story behind Passover, we remembered our own sacraments of Baptism and Holy Communion, and then we shared a meal. That was, for me, a highlight of Holy Week. On this second Sunday of Easter we contemplate the disciples who locked themselves in a room… because they were afraid. They were afraid in spite of the news that Jesus was no longer dead. Approximately 2000 years later we might wonder about their fear. Like, how could they have not believed Jesus’ predictions of the events that would transpire? How could they not gather strength from the wonderful news that Mary and friends had reported? How could they cower in fear? Would we be any different? I look around and I see a society in the grip of fear. We seem to have so much to fear…and sadly, those fears are being exploited in so many ways that we can’t really enumerate them right now or we’d be here all day. Fear is an emotion that is mentioned frequently in our scriptures. Fear is an emotion that immobilizes us, so much so that a common command given to God’s people is, “do not be afraid.” Why? Because when we operate out of fear we do nothing or tragically, we are capable of doing pretty horrible things. Not just us…but all people, or groups of people…when driven by fear, are capable of the most atrocious behavior. Which takes me back to our story behind the story of Passover. Most of us are familiar with the story of God’s deliverance of Israel out of slavery in Egypt. The story usually starts with Moses and God’s calling him to deliver his people. But how did they come to find themselves in such a precarious position? It wasn’t an overnight thing…or a kidnapping and forcing into slavery thing (like the shameful part of our own American history). The oppression of the people happened gradually and the root of it all was fear. Yes. Fear. You see the Egyptians saw that their Israelite neighbors were growing in number. The Egyptians saw that their Israelite neighbors were prospering. The Egyptians began to fear these neighbors. Fearing that their growth would eventually cause them to take over…to displace them. I’m sure that demagogues were active in stoking this fear of Egyptian towards their neighbor. But rather than build a wall to keep out the Israelites (since they were already there) or mass deportation of their Israeli neighbors, they decided to just oppress them. And when oppression didn’t work they opted for a horrible form of genocide in killing all the baby boys. The story of Moses starts with these attempts at genocide. People can do atrocious things when they are afraid. God knows this. So not only do we have the continued call to “not be afraid,” we have the common instruction to remember the oppression of Egypt. Why? So that it never happens again. The Israelites were to remember that they were once slaves in Egypt and thus to treat the strangers…the sojourner…the refugee…the non-citizens in their land with compassion, with care, with justice. These stories, and Jesus’ words are pertinent to us today. How do we, as followers of Jesus, treat the immigrant, the refugee, the stranger in our communities? What do we do when a story as old as time is so pertinent for today? Do we give in to fear and reject the stranger? In doing so we are most likely rejecting Jesus. Do we listen to the words of Jesus, “I was a stranger and you welcomed me,” but stay silent? I think of the disciples hiding in a room out of fear. They were afraid of those in power, they were afraid of being arrested, they were afraid to live as Jesus had taught them to live. Then, into the midst of this fearful existence Jesus appeared. “Peace.” So much in this word. Peace. Don’t be afraid. Don’t worry. But also don’t stay here. Don’t stay locked up in this room. Don’t stay locked up in your fears. Peace… and go! As the Father sent me, I send you. I send you out into the world to be bearers of the peace I give you. I send you out into the world to learn to love your neighbor and to teach others to do the same. I send you to counter the fear that divides and diminishes and destroys peace. This peace, this call, this promise of the Holy Spirit, this sending is for us. It’s a great gift. It’s an awesome responsibility and thus scary. It is not hypothetical. On Friday a couple that has loved here in Oxnard for 24 years was deported. They were pastors at a church in Colonia. They literally lived across the street from us…can’t be any closer neighbors. They are grandparents. Their grandchildren are students in our preschool. So today a church worships…mourns… the loss of their pastors. A son and a daughter mourn the loss of their parents. And most upsetting, preschoolers no longer have their grandmother who cared for them while their parents worked. These children don’t understand why their grandmother is suddenly gone. How do you explain that fear of the stranger has resulted in the expulsion of their grandparents? As I contemplate this I wonder how we benefit from all of this? I cannot see how we are anything but diminished. I am also reminded of other words from Jesus. Words of love and forgiveness. And as I remember these words I hope and pray that they will empower us to go out into the world and combat the fear that leads to the oppression of the immigrant. Can anything good come out of Oxnard? Was he referring to this text in John’s gospel? Where Nathanael seems to initially reject Jesus because he was from Nazareth? Philip had invited him to come and meet Jesus, who just might be the promised Messiah. But this promised Messiah was coming from the wrong town, the town with the bad reputation. We don’t really know why Nathanael scoffed at the idea of something good coming from Nazareth because we don’t know too much about the town except that it was small. And maybe that’s the point… sometimes we scoff at or are afraid of that which we don’t know. I remember being in a group of people in Ventura a few years ago. The leader was asking where everyone was from. Most were identifying some neighborhood in Ventura. I said, “Oxnard.” And the leader replied, “I’m sorry.” We’ve since become friends and I’m not sure he would respond in the same way today. I think that all of us in Oxnard, whether we live elsewhere and worship here, whether we’ve moved here, or whether we were born here and continue to live here… I think that we all can say there is mostly certainly good that comes out of Oxnard. We can be proud here at Our Redeemer that we are known for our excellent preschool…good comes from here! So maybe we are better prepared than others to not so quickly dismiss a place because we don’t know enough. I’ve told you stories of my once upon a time fear of parts of Los Angeles. In retrospect my fear of LA was a racist fear of others…or people I didn’t know. But then I went there and spent time and learned how ignorant I was. Today, in our divided nation and even divided world, we may find ourselves asking the question more often…of places, of people, of affiliated groups. All of my sermon up to this point was written before the news broke of the president using vile language to describe countries south of our borders (Haiti and El Salvador) and all the countries that make up the continent of Africa. What I had written after this point seemed so sadly connected and yet irrelevant…so an update was in order. Can anything good come out of El Salvador? Can anything good come out of Haiti? Can anything good come out of Algeria, Angola, Benin, Botswana, Burkina Faso, Burundi, Cabo Verde, Cameroon, Central African Republic (CAR), Chad, Comoros, Democratic Republic of the Congo, Republic of the Congo, Cote d’Ivoire, Djibouti, Egypt, Equatorial Guinea, Eritrea, Ethiopia, Gabon, Gambia, Ghana, Guinea, Guinea-Bissau, Kenya, Lesotho, Liberia, Libya, Madagascar, Malawi, Mali, Mauritania, Mauritius, Morocco, Mozambique, Namibia, Niger, Nigeria, Rwanda, Sao Tome and Principe, Senegal, Seychelles, Sierra Leone, Somalia, South Africa, South Sudan, Sudan, Swaziland, Tanzania, Togo, Tunisia, Uganda, Zambia, and Zimbabwe? Can anything good come from these countries whose residents have dark skins? Or does all the good stuff come from countries like Norway, whose residents are white? On this weekend, when we honor the ministry and legacy of the Rev. Dr. Martin Luther King Jr., we are presented with these questions. Our faith gives us the answer. The answer is not found in the stories of all the good that has been done by immigrants from these countries…and other countries. Certainly their contributions help to make America great, even as we remember that except for Native Americans we are all from someplace else. It’s also important to remember that the majority of our African American brothers and sisters trace their roots to people who were forcibly kidnapped and sold as slaves…and it was their work…unpaid work…that led to much of the prosperity upon which this nation was built. We are still dealing with the legacy of this racism… of this evil. I digress… the answer to the question of whether anything good can come from these countries is not found in the good things that people from these countries do…as appreciated and honored those good things are. But the problem with uplifting people who’ve done well is that we imply that they must earn the respect that is due to them as human beings. No the answer to the question of whether anything good can come from these countries…through our faith…is a resounding YES! It is very good… our created world and all the inhabitants. Because of sin, no place is perfect, including these United States. Because of sin, no person is perfect, including you and me. And that is why Jesus came… because of love for this big giant imperfect mess of a world. And his primary teaching to his disciples and to us is that the only way that we could make things better and that is to love one another as we love God. It’s that simple and it’s that difficult. Did you notice Philip’s response to Nathanael’s question? He didn’t argue. He just said, “come and see.” And with these words took Nathanael to meet Jesus. I have a friend who organizes a mission trip to El Salvador every August…who wants to go? I’d love to join him, while bringing others along. But maybe we can’t all travel to other countries. We can still make concerted efforts to learn about people of other nationalities, faiths, and political perspectives so that we can see the humanity and even the face of Jesus in those we do not know. Jesus loves them and invites us to love them too. This is not so much a memory of a racist policy but rather an example of the heartbreaking divisions that can hit us at a young age. I was in 7th grade at Hamilton Jr. High in North Long Beach. We were a mixed race school but I don’t remember having any black friends. I actually don’t really remember having any friends. I was/am an introvert, and a painfully shy one at that. Because of moving around as a child this was already my 5th school. I wouldn’t be here long because we’d be moving again. Physical education. These were the days we had to wear silly looking PE uniforms, with snap front blouses and elastic leg bloomers. Because of these we also had to use a locker room to change. Once dismissed from class there was usually a big rush to go change. One day we were all sitting on the ground when this dismissal came. Lots of girls (I think we were an all girl class) started running. I was not one of them. Instead I slowly began to stand. But before I pulled my legs in another girl tripped over me. She’d been running and was now sprawled out on the ground. She was also incredibly angry because she insisted that I purposely tripped her. I apologized while also insisting that I hadn’t seen her. She didn’t believe me. She continued to insist I tripped her. She thought I did so because she was black and I was racist. I didn’t have skill to deal with this and still remember just wanting to crawl into a hole. This incident almost led to a campus fight between black and white. I was afraid and I felt awful. Whenever I think of this I still feel awful about it. Not just for me but for that other girl. The one who had, at her tender age, already experienced enough racist aggression that she was absolutely sure that I’d attacked her. I wonder where she is and how she is doing. I pray for her as I pray for the day when our world will be one where precious children of God are not attacked and disrespected solely for the color of their skin. And I hope that when that day comes, accidents such as the one that happened on a schoolyard so many years ago would just be experienced as accidents. How Long Does a Dead Tree Stand? On a recent vacation to Yosemite we witnessed the overwhelming number of dead trees in California. I read an article that places the number at more than 100 million in the state. Dead trees are normal, but not usually in such large numbers. 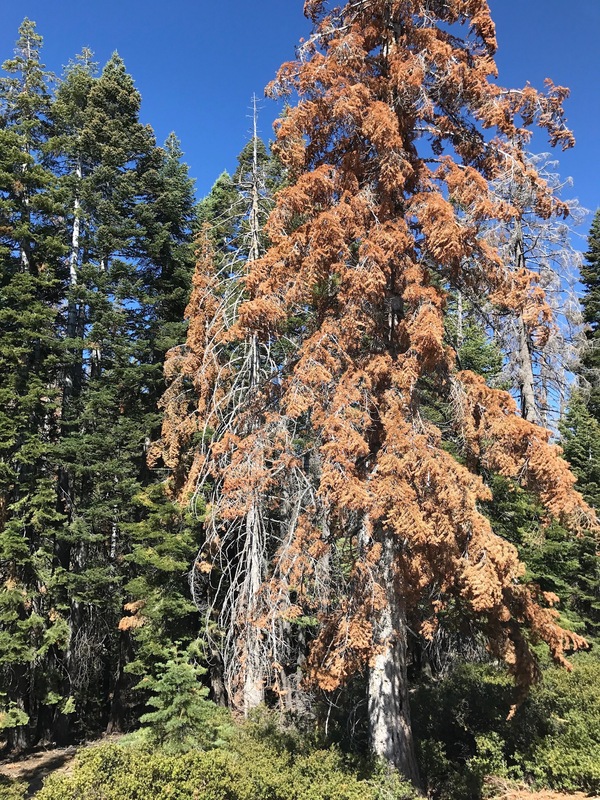 The current dead tree phenomenon is the result of drought weakening trees and then bark beatles killing them. But they don’t seem to fall… standing tall… and dead. As I looked at tree after tree, I couldn’t help thinking of them as a metaphor for some of our institutions. Standing tall, but really dead. Is the church one of these dead institutions? It is for those who don’t believe they can experience unconditional love and community at a church. It is if it chooses to remain silent in some misguided effort to “be nice” in the face of today’s rising intolerance. It is if it’s members don’t leave their pews and build relationships in their communities. 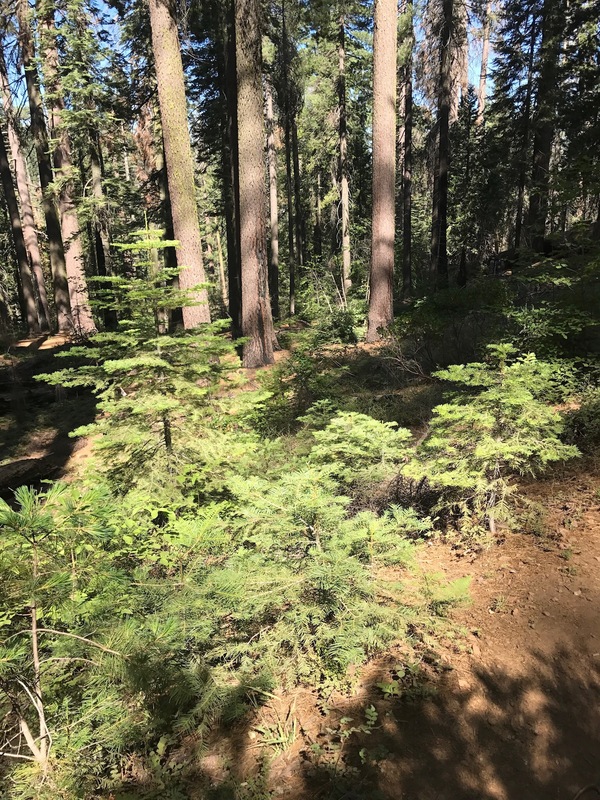 See these new trees? They’re a hopeful sign… a sign of new life, of God’s grace… a sign that God is indeed active in the world. Will we go out and join in that work? Or will we continue to admire our dead trees until they actually fall? This morning and last night white supremacists demonstrated in Charlottesville Virginia. That is a very long way from Oxnard California, but both cities are in the United States. For this reason what happens there is important here and everywhere else. As a white middle class woman I denounce the racism of white supremacy. It is not the responsibility of my brothers and sisters of color to denounce racism. They have enough to do in living the effects of racism. I call on all white people who hear the command of Jesus, to love God and to love neighbor, to come to the defense of their non-white neighbors and denounce racism in all it’s forms. This is our call for these times.